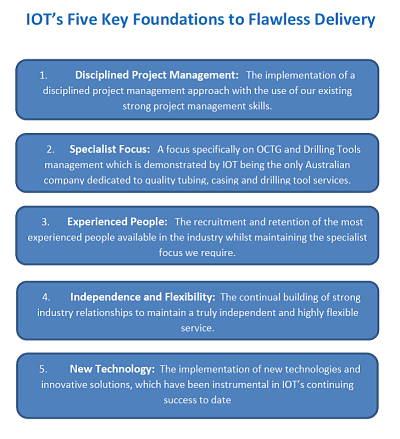 IOT / RAU is the truly independent provider of OCTG services to the Oil & Gas Sector. IOT / RAUis a 100% Australian owned and operated company. Our business footprint extends across Australia and into remote Global locations. We are here for you and with you for the long term. Our capabilities and services can be Operational 24/7 within our designated all weather premises. IOT / RAU has established a niche as a truly independent provider of integrated services and are renowned for transparent business practices. Our transparency has resulted in being nominated both critical supplier and distributor to numerous Multi National Companies. We therefore have a strong industry network that ensures we can assemble the best resources industry can offer. IOT is well placed to ascertain the most appropriate subcontractors and their capabilities within the Australasian region to ensure Third Party Compliance. As a leading Integrated Management Specialist Company, We have the experience in all the services that matter. Our people and their experience, expertise and reputations as honest, skilled professionals are the core strengths of our business. This is further enhanced by our business partnerships and the professionals who represent them. Our local success has lead to rapid expansion in many international locations with our Alliance partners. All IOT / RAU employees actively participate in quarterly Training programmes to ensure they are up to date with current industry standards. All IOT employees are certified in all OEM inspection equipment. IOT / RAU continues to be ISO accredited. 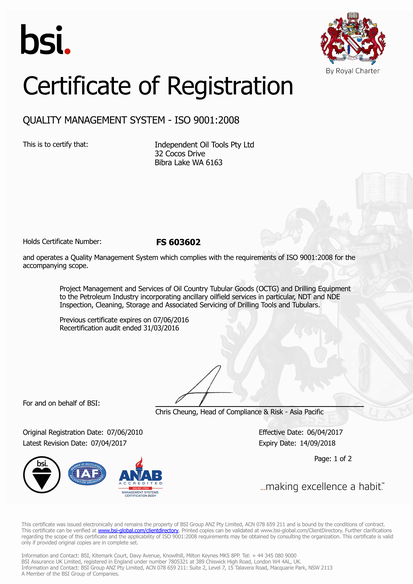 This accreditation is a result of IOT's / RAU's commitment to continued improvement and adaptation to our customers requirements. 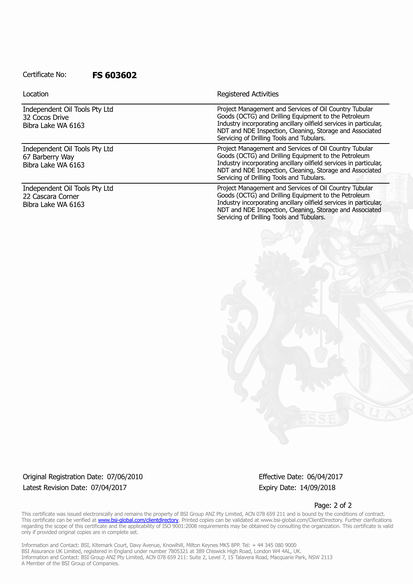 IOT / RAU is the only recognised Refurbishment & Inspection company to hold such qualification. © Independant Oil Tools Pty Ltd. All Rights Reserved.